This is a special release of the Tom Kuhn RD-1, made especially for Tom Kuhn himself. Tom apparently loves orange dyed yo-yos, so a special batch of these were made for him. 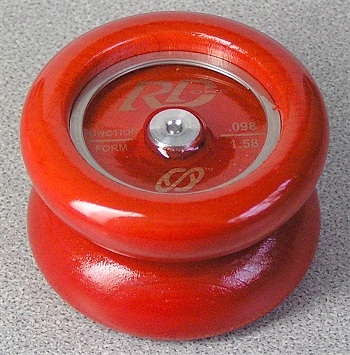 The RD-1 was a special wooden model, designed to improve the stability, true spin, and balance of wooden yo-yos. Previous models like the Sleep Machine and Roller Woody alway had a small bit of wobble, because there was no way to make wood NOT warp or shrink with time. The RD-1 and RD-2 also were shape for maximum weight distribution toward the rims for longer spins. The hollowed out centers were filled with an epoxy that also stabilized warping and shrinkage of the wood. The result, a perfectly balanced wooden yo-yo. This one has the optional metal weight rings installed.